June was not the busiest month for us but we got out a good few times. The Yellowfin Tuna have been absent other that a really good strike the other day we have seen no Tuna action, the Bonnies have been around in big numbers and have provided great fun on light tackle. Bottom fishing in general has been really good with some really decent size fish coming out, Shark activity has been very high and we have been taxed of a number of good fish over the month. Weather for most days has been calm and stable but there have been a few days with some heavy winds. With Sardine reported all along the South Coast I think all the Tuna have been down that side. If the sardine run carries on the way it has been so far it looks to make us a very promising Game Fish season this next summer. 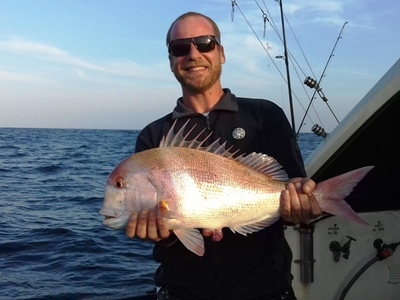 Bio: I have been fishing since I was 5 years old in Durban and have fished many places around the world and in South Africa, but Durban is my home waters. I fished competitive for many years and I have been running my own charters since 2008 with 2 companies and 2 boats, fish a variety of styles and target a variety of fish species in both Salt and Fresh water, have many published articles in several magazines on fishing. Love nature and outdoors, Am very conservation minded and have a passion for birds. I am crazy about big Tuna, Marlin Fishing and Game Fishing, and also love light tackle spinning, am a total lure junkie. Represented my province in fly fishing for many years and am also pro staff for Rapala/Shimano. I want to write a book on fishing one day. 3 items left on my fishing bucket list, guess then a new bucket list will be in order. As a writer I have my own quote: \"I love taking people fishing because it releases their inner child, and in doing so keeps my inner child alive.\"